Well now, how in the world could I have been expected to pick just a few favorites among the literal hundreds of amazing wedding footwear styles you shared with us?!? Every pair was perfect and stunning and unique in its own way, and there was no way to choose the best. So I didn't! Instead, this week I'm sending you directly down to the comments to OOH and AAH over all the great photos. I spent my coffee hour this morning un-graying everyone — I figured that way, lots of people would be out of the grays AND you could easily scan all of the pictures. Win-win! Also this comment nicely sums things up, don't you think? just wanted to say that I've only read through about a 10th of the stories and you all rock. I want to go to a Jezzie wedding. Why does everyone I know think white satin (aka shoes they would NEVER wear IRL) are the only way to go? Wait no, I take it back: we should end by saying BEST WISHES!!! to TyrannosaurusBataar who is getting married this weekend in these kate spade glittered numbers! 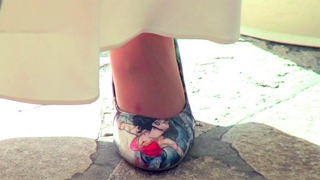 Top: Jessi03's awesome Wonder Woman wedding shoes.